The shift of concerns from when an investor is working to when an investor is retired is the focus of Spectrem’s new study The Convergence of Health and Wealth. The financial preparation of investors for the health issues that are destined to come is a key component of many investors’ investment strategies, and those preparation levels are examined in the study. There are legal protections investors can create to avoid costly effects that stem from a change of health and mental capacity in the future. Among retired investors, 69 percent have arranged a medical power of attorney, and 56 percent have created a financial power of attorney to protect their assets and their families from any harm that could come resulting from a change in health and cognitive function. 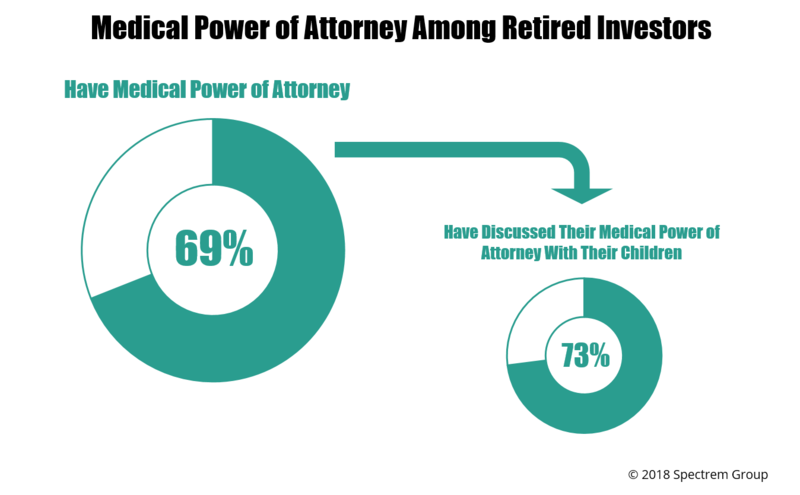 Among those retired investors who has issued a Medical Power of Attorney, 73 percent have discussed with their children the specifics of that legal maneuver. Sixty-nine percent of retired investors are receiving monthly income from a pension. That percentage could drop over time as pensions become less favorable among employers or are altered by federal regulations. Those investors expect their pension payments to provide 44 percent of their annual income. Twenty-five percent of affluent retired investors have income from annuities, and 24 percent do not receive income from either of those sources. Of those investors with annuities, they expect that source to provide 7 percent of their annual income. Retired investors anticipate that Social Security will provide 25 percent of their annual income, and 22 percent will come from other assets. Those income streams are vital for retired investors who must consider the fiscal impact of health changes for themselves and their spouse. Health and health care costs are the primary concern of retired investors, although the level of concern is relatively low and lower among retired investors as net worth increases. Among all retired investors with a net worth of at least $1 million, their top concern was their spouse’s health, measured at 57.17 on a 100-point scale. Their own health came in at 54.61, and concern over a health event that would require a significant increase in care rated at 54.82. Those were the only concerns that registered over the midpoint on the 100-point scale. The concern over paying for health care services came in at 48.13, just below the mid-point and just below the concern over taxes, which came in at 48.26. Among retired investors, 28 percent believe their housing issues will be their No. 1 expense in retirement, and 24 percent believe it will be medical expenses. Twenty-one percent anticipate taxes as their No. 1 expense. Those three issues claim 73 percent of the nods as the No. 1 expense in retirement. Concern over health and health care is a time-released matter; young investors do not worry about such matters until they become middle-aged, and some middle-aged investors put off worrying until they approach retirement. By then, of course, providing adequate income in retirement could be problematic. There is no time when it is inappropriate to consider the costs of health care. If an investor remains in the workforce, advisors need to make sure they have started the planning process for the day when they need additional cash. For investors who have retired, there are adjustments that can be made in a portfolio to better serve the needs of the investor when health becomes problematic and expensive.